The continuing increase in lifespan is unfortunately associated with an increased prevalence of cognitive dysfunctions, including memory loss and diminished ability to form new long term memories. More dramatic and devastating are the cognitive and memory losses in neurodegenerative diseases such as Alzheimer’s Disease (AD), in which the impairments interfere with normal life functioning. proteins and neurodegeneration. Thus, soluble oligomers, protofibrils and fibrils of the Aβ (amyloid β-peptide) and tau protein accumulate in specific brain regions. This is associated with the progressive destruction of synaptic circuits controlling memory and higher mental function. All the major pathological events in Alzheimer’s brains, including cell death, amyloidosis and neurofibrillary tangles can be explained by dysregulated insulin/IGF-I signaling in the brain. Alzheimer patients show resistance to insulin and IGF-1. The altered CNS expression of genes encoding insulin, IGF-I, and IGF-II, as well as the insulin and IGF-I receptors, suggests that AD may represent a neuro-endocrine disorder that resembles, yet is distinct from diabetes mellitus. AD and all of the age-related neurodegenerative disorders are fundamentally protein-folding disorders. In AD, excessive levels of a peptide, Aβ (amyloid β-peptide), and a protein, tau (microtubule-associated protein), both of which are normally soluble, become misfolded and aggregate in β-pleated sheet amyloidogenic structures. Aβ fibrils accumulate in extracellular plaques and comprise peptides of 38–43 amino acids which emanate from β- and γ-secretase-induced proteolytic cleavage of the APP (amyloid precursor protein). Aβ is normally synthesized in the brain. However, Aβ deposition in plaques occurs at high levels in AD. Tau is normally highly soluble and and its best known function is the stabilization of microtubules in axons Aggregates of insoluble tau form structures called NFTs (neurofibrillary tangles), which build up within the neuronal cell soma, in the neuropil and in neuritic components surrounding Aβ plaques .In the case of tau, the misbehaviour and self aggregation of the protein in NFTs is closely linked with tau excessive phosphorylation. AD is a disease of slowly progressive synaptic collapse affecting areas of the brain underlying memory and higher mental function . Synaptic loss in these brain areas relates directly to the progressive cognitive decline that characterizes AD. Studies suggests that increased production and/or decreased clearance of aberrant conformations of Aβ is the primary initiating trigger for AD . However, the presence of iperphosphorylated tau, and the progression of tau pathogenesis, is believed to be an essential mediator of Aβ pathophysiology and to be necessary for the progressive cognitive decline in AD. AD occurs randomly in the aging population and the underlying cause of protein misfolding, synaptic malfunction, and associated cognitive decline remain unclear. The primary signalling mechanism that becomes defective with age in AD is the IIS insulin/IGF-1 (insulin-like growth factor 1)-like signalling] pathway. This pathway alters the normal protein homoeostasis of Aβ and tau, and initiates a pathophysiological response to the altered Aβ and tau, causing cognitive decline/synaptic loss. The insulin superfamily of peptides is evolutionarily ancient. In mammals, insulin, IGF1 and IGF2 are generally considered to be peripheral peptide hormones that regulate fuel metabolism and tissue remodelling, respectively. In recent years it has become clear, however, that these peptides also have various functions in the brain. In addition to local production of IGF1 and IGF2, the brain receives ILP input from the periphery, so that both a paracrine and an endocrine ILP system operate in the adult brain. The liver and the pancreas are the main contributors to circulating ILPs: peripheral insulin is produced by pancreatic β-cells, and IGF1 and IGF2 are mainly produced by hepatocytes (although all tissues express IGFs). In response to glutamate release by active synapses, cells of the neurovascular unit (neurons, astrocytes, pericytes and endothelia) release prostaglandin E2 (PGE2), arachidonic acid derivatives and ATP. These mediators stimulate the activity of matrix metalloproteinase 9 (MMP9), which in turn cleaves IGFBP3 — the major carrier protein of IGFs in blood — resulting in the release of bioavailable IGF1, which is now free to bind to vascular IGF1 receptors. IGF1 is transported from the lumen to the basolateral side of the vessel. 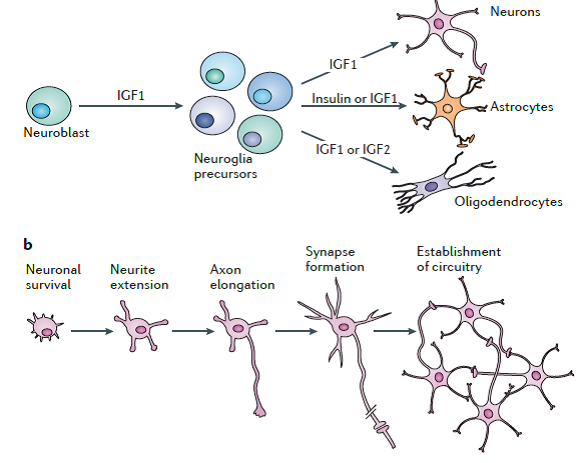 Thereafter, IGF1 is either transcytosed from astrocyte end-feet to or directly interact with IGF1 receptors in neurons. 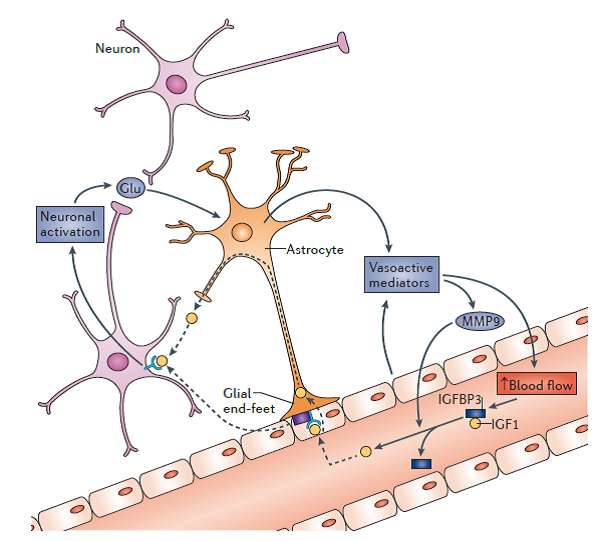 The circulating IGF1 enters into the brain ‘on demand’ to provide localized support to active brain regions, and this occurs in parallel with the process of neurovascular coupling, with which it shares various mediators. survival and differentiation of all types of brain, thereby having a profound impact on brain size. Indeed, a lack of IGF1, IGF2 or insulin results in small brains. IGF1 haploinsufficiency causes microcephaly in children. The effects of ILPs on brain development promote the establishment of specific cell populations and circuitries that support the central control of energy homeostasis. Cell differentiation and circuit formation take place at later phases of brain development, and both are modulated by ILPs . ILPs modulate the timing of neuronal differentiation and related events, such as axonal development and synapse formation, dendritogenesis and synapse maintenance and thereby have a role in experience-dependent circuit plasticity. The development of glial cells is also modulated by ILPs. Insulin and IGF1 levels during development influence the formation of astrocytes and both IGF1 and IGF2 regulate oligodendrocyte differentiation. Central regulation of energy homeostasis. The brain is the main consumer of energy and the master regulator of its allocation.. Nutritional inputs such as glucose and lipids modulate ILP signalling in the brain, alters the insulin output by the pancreas, and thereby lipid and carbohydrate storage by peripheral tissues. Role of ILPs in neurodegeneration. IGF1 is considered a neuroprotective agent, a neuronal pro-survival factor in all types of brain injuries. ** Modulation of synaptic plasticity. ILPs influence learning and memory by modulating neuronal plasticity. **# At the cell membrane, ILPs modulate neuronal excitability by regulating ion channel availability and activity. **# GABA and glutamate receptor availability is also modulated by ILPs. GABA and glutamate receptor trafficking between intracellular organelles (ER and endosomes) and the membrane involves phosphorylation and dephosphorylation of receptor subunits, which is modulated by ILPs. Insulin elicits LTP by increasing the number of NMDA receptors at hippocampal synapses through SNARE -dependent exocytosis. **# ILPs also modulate synaptic strength by controlling the synthesis and release of diverse neurotransmitters such as acetylcholine or dopamine. **# Finally, ILPs regulate the synthesis of synaptic proteins, contributing in this way to synapse sculpting. Even though ILP receptors show a certain degree of promiscuity in terms of their ligands, their activation always recruits the same specific intracellular cascades. Activation of the insulin receptor and the IGF1 receptor induces common signalling cascades, although the biological effects of the activation of each receptor are distinct. Canonical signalling through insulin and IGF1 receptors includes occurs via activation of PI3K and thereby the serine threonine kinase Akt [also known as PKB (protein kinase B)] . 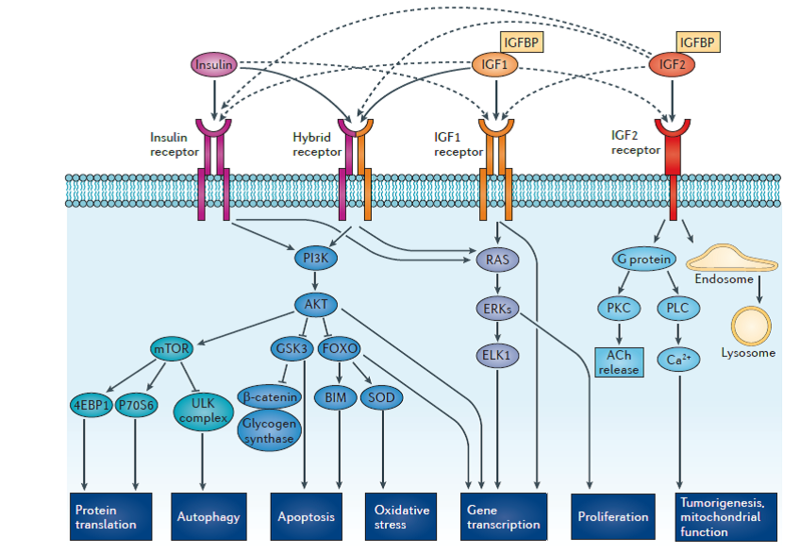 Akt in turn phosphorylates other target proteins, including mTOR (mammalian target of rapamycin), and inactivates GSK3β (glycogen synthase kinase 3β) and FOXO (forkhead box O). The primary negative regulator of this pathway is the lipid and protein phosphatase PTEN . The IIS activates different pathways that modulate gene transcription and activate myriad downstream kinase–phosphatase branches that ultimately affect key cellular processes such as protein synthesis, autophagy, apoptosis and resistance to oxidative stress . Insulin receptor and IGF1 receptor signaling generally have the same effects in peripheral cells as in neurons, with the important exception that insulin receptor activation is a major regulator of glucose handling by peripheral cells but not by brain cells. -A direct stimulatory action of insulin on β amyloid release by neurons. -Competition of insulin with β amyloid for insulin-degrading enzyme (IDE), a protease that shares both insulin and β amyloid as substrates. Altogether, these data indicate that the net action of insulin will be to increase extracellular levels of β amyloid in the brain. However, it is difficult to establish the precise role of insulin in the pathogenesis of Alzheimer’s amyloidosis. A primary role in the disease has been ascribed to the development of insulin resistance that is found in association to high insulin levels in Alzheimer’s patients. Loss of sensitivity to insulin will lower cellular release of β amyloid, and this represents apparently a contradiction. Furthermore, at high levels, insulin may interact with IGF-I receptors located at the blood–brain barrier interface and in this way favor clearance of brain β amyloid . This contradictions are solved by the comprehension of the role of IGF-1 in modulating brain β amyloid, and the consequences of a IGF-1 resistance, leading to Alzheimer disease. Disrupted IGF-I input to the brain may be involved in the pathogenesis of amyloidosis. First, alteration in IGF-I signaling takes place at the cells that constitute the brain barriers (endothelium of brain capillaries and epithelium of the choroid plexus. The choroid plexus epithelium is a primary target of IGF-I-mediated clearance of brain . 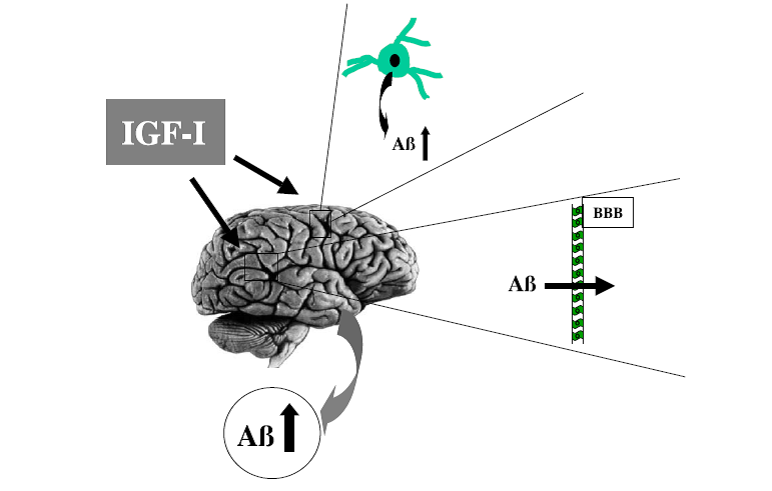 In step 1, reduced sensitivity to blood-borne IGF-I at brain– barrier cells (BBB) causes reduced clearance of β amyloid originating brain accumulation of β amyloid (step 2). 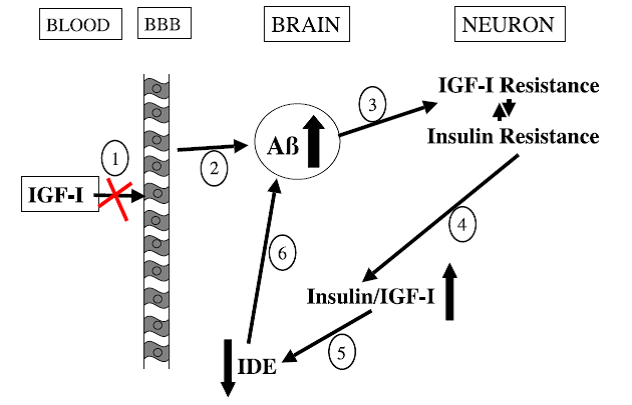 Increased levels of β amyloid antagonize insulin and IGF-I binding to their corresponding receptors, which induces a resistant state to insulin/IGF-I in neurons (step 3). Aβ can bind to IRs, inducing IR internalization, and can hyperactivate mTOR, inappropriately increasing the activation of the IIS pathway.. A sustained activation of IIS will have a direct effect on the hyperphosphorylation, conformation and function of tau. Akt can directly phosphorylate tau, an event closely linked to the detachment of tau from microtubules and possible initiation of tau pathogenesis. In response to this resistant state, a homeostatic compensatory mechanism develops whereby levels of insulin/IGF-I increase in an attempt to rescue loss of function on target cells within the brain (step 4). 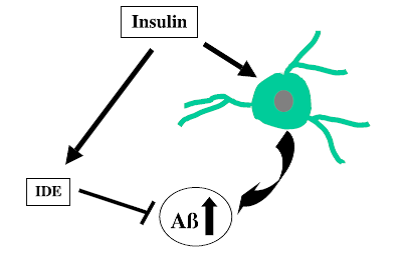 High levels of insulin diminish availability of insulin-degrading enzyme (IDE) to degrade β amyloid (step 5) and as result more β amyloid accumulates (step 6). Steps (3)–(6) establish a self-perpetuating vicious circle. The majority of cases of Alzheimer’s disease appear late in life. During aging, there is a progressive loss of sensitivity to IGF-I and also to insulin, and a decline in circulating levels of this growth factor. affect their barrier properties and their general functioning. Fortunately, only a proportion of the aged population eventually develops Alzheimer’s amyloidosis. IGF-1 availability , regulated by IGFBPs. TNF-alpha, a proinflammatory cytokine that usually reduces sensitivity of targets cells towards these two hormones. Insuline resistance is a common finding in diseases that are increasingly frequent in modern societies. Alzheimer’s disease can be included in this category; a fact that has been related to food consumption and sedentary habits in western life style. Is Alzheimer disease “Type 3” Diabetes?